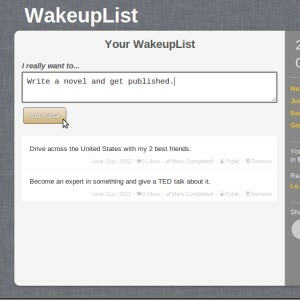 Wakeuplist is a social app and community where you can create and share your own bucketlist online with the world. Create your own bucket list now! I’m a big believer that there is more to life than having nice toys and enjoying expensive wine. I’ve always felt that the richest people are those who have genuine relationships with others and have had meaningful experiences to look back upon. Both things, which require very little money. So, it’s no surprise to me that researchers would agree that money doesn’t buy happiness, well, sort of. Part of their argument suggests that those who are more affluent (make over $300,000/year) fail to enjoy the smaller things in life because they are more preoccupied with their money. All things which we here at the WakeupList approve of, whether you have deep pockets or not. Wake up, get breakfast, go to work, come home, have dinner, watch tv for a few hours while browsing the internet, and then go to bed. Repeat. Most of that we can’t change. Yes, we have to go to work so that we can afford to survive. But life doesn’t just have to be about working for the weekends. You don’t need more than 1 hour in a day to learn about or how to do something new. And it’s never been easier with all the free resources to teach you on the internet. Want to learn spanish? Try Duolingo. What to learn how to play the guitar? Get strumming. Want to learn about bayesian statistics? Who doesn’t? They say that we live in amazing times, and it has never been truer. There are millions and millions of people who are sharing their rich knowledge for you to access for free on the internet right now. There is really little excuse not to be learning something today. In addition to keeping a wakeuplist, I highly recommend that you keep a list of what you have done and learned. Keep it by your bedside table. 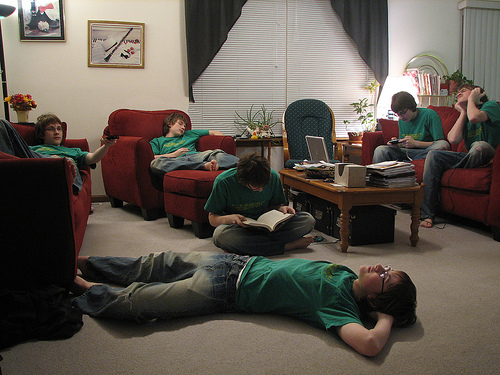 Every night, when you go to bed, just write 1 or 2 sentences about what it was you learned that day. It really takes no effort at all, and it will help put your mind into the active habit of learning. Plus, after a year, you’ll be able to look back and see your amazing progress. If you think about it, we’re only alive for a very short period of time. For the billions of years that the universe has and will be in existence, you and I will most likely not even see 100 of them. So it’s crucially important to make sure that every minute or every hour is spent in a way that we won’t regret. Now, I’m not saying to become irresponsible and quit your job to start a cupcake company (although I won’t stop you…) What I am saying is to consciously think about the things you do, and whether what you’re doing right now is a good use of your most precious commodity: your time. In particular, there are few giant time wasters that I think we all need to cut back on: television, the internet, and video games. Now, there are certainly good and productive things to do with each of these mediums – for instance, watching PBS documentaries or using the internet for research are both educational and useful. But let’s be honest, we only do that for a small fraction of our time. Instead, we log onto the internet, and go to sites like reddit or facebook so that we can see pictures of cats doing stupid things (or friends doing stupid things). I for one, love a good cat picture, but what I don’t love is spending 3 hours looking at cat pictures only to realize that an entire evening had just gone to waste. The internet is an absolute addiction. Instead, I want you to try something. I want you to go on an entertainment diet. You don’t have to go cold turkey, but please try and cut back. Limit internet browsing for fun to just 30 minutes at the end of your night. Make it a treat after a hard earned day. If you watch alot of television, then choose just 2-3 tv shows to follow each week, and make it a point to only watch those shows and turn off the tv when they’re done. Welcome to the WakeupList Blog! 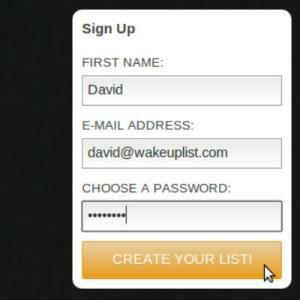 Wakeuplist is a free online bucketlist making tool. We originally built this for ourselves as a way to keep track of all the amazing things we wanted to do in life. Wakeuplist is different from other bucketlist sites in that we casually remind you (only once every 90 days) via e-mail about all the great things on your list. You can also browse and add ideas from other’s lists. 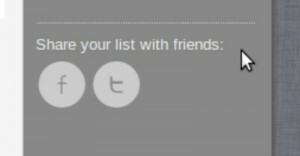 We don’t spam or sell your information, and we only ask for your name and e-mail so we know how to send you your list. We hope you like it! Step 1. Sign up. We only ask for your first name (or whatever you’d like to be called) and your e-mail address so that we know where to send you your list in the future. Step 2. Add life goals to your list. We recommend be as specific as possible so that you can have a clear target and know when you’ve achieved it. Add each goal seperately. Step 3. Browse the site to see what other people have for goals. 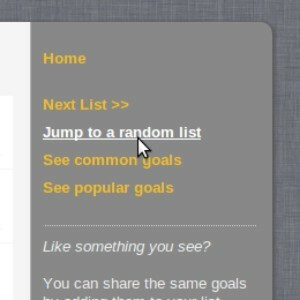 When logged in, you can add their goals to your list if you like them! Step 4. Share your list with your friends via Twitter or Facebook. Step 5. Go off and make the most of your life. Every 90 days (once each quarter) we will send you your list via e-mail. You can come back to the site to add more goals or mark the ones you’ve accomplished. But most importantly, you can be reminded and get back on track to living the life you’ve always wanted. We really hope you can make the most of this site, we’d like to think in a small way we’re making the world a better place! Wealthbit.com - All Rights Reserved. Copyright 2012.